Your high top Vans sure do look cool, but wouldn't it be great to have that style and be protected too? With the new Speed and Strength Soul Shaker Shoes, you can now have just that. 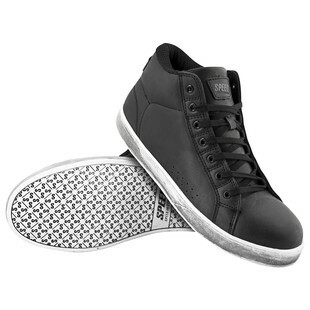 Possibly the biggest advantage of the Soul Shaker over a casual sneaker, besides the integrated toe and ankle armor, is the top grain leather upper construction. The more these shoes get used, the more they will break in, and the better they will look! The fitment is wide to be comfortable on those long days in the saddle, and the sole is anti-slip to give confidence when coming to a stop. Perfect for those rocking riding jeans and classic leather jackets around town, the new Soul Shaker shoes look right at home both on and off the bike. This is the best kind of protection, the kind you know you have, but no one else has a clue.